The BARDAID Initiative was launched in 2010 to help to inspire the next generation of potential writers and performers; stymied by a technology and results based curriculum that doesn't have the time to encourage reading and writing for pleasure. What began in 2010 as a project to raise money through the promoting of poetry events; in order that we could buy small press, non-curriculum poetry books from independent poets, that we could then put into senior school libraries in a bid to inspire the poets of the future, has grown to the point where The Bardaid Initiative have now created three libraries of their own from scratch and revamped and taken over the running of a fourth, council owned library! Two of our libraries are school libraries; the first (at Roman Fields School in Boxmoor, Herts) started in 2012 in a converted broom cupboard. Over time the collection grew to take over a whole wall of a classroom, but as of March 2019, (with the aid of three hundred more books donated by Bardaid, and a lot of work undertaken by school caretaker, Steve Patmore) the library has now moved to its own dedicated room. Our second library ‘BARDAID BOX 1’ is situated inside a defunct K6 telephone kiosk in Long Marston, Herts, which we bought from BT in November 2017. The box houses an impressive collection of both fiction and nonfiction, plus a shelf dedicated to small press, non-curriculum poetry and story books, that have been donated to us by independent poets and authors, as well as a number of publishers too. The box is open to everyone, 24 hours a day, seven days a week on a 'read'n return or read'n replace' system. The library is restocked every month with books that have been donated to us. 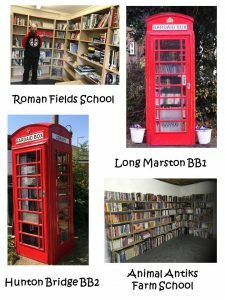 Having seen this, in June 2018 we were asked by Abbots Langley council to take over an existing telephone box library in Hunton Bridge, Herts, which we did; stripping it down, repainting it and restocking it in the same style as BB1. 'BARDAID BOX 2' runs on the same system as its twin and has proved equally as popular with local residents and local writers. Our fourth library has been built at Animal Antiks Farm School in North Marston, Bucks, inside the old dairy. It is our biggest project yet and has a huge section of encyclopaedia and educational books as well as a large collection of children's and young adult books along with a comic and graphic novel section. Scroll down to see all of the schools that have received BARDAID caches. If you'd like to see your school on there, contact us today! A big 'thank you!' to all at the 'Aston Clinton Charitable Foundation' for donating £500 to BARDAID, enabling us to cover the next three book drops! On 24 January, we delivered our first Bardaid book drop of 2016, to the Hunton Bridge Community Library, Hertfordshire, a rather splendid second life for the village's old telephone box! If you know a telephone box in need of some damn fine poetry let us know. In June 2015, a second cache has been delivered by the wonderful poet, Indigo Williams, to St Gabriels', South London. The books were again received by the equally lovely Gail, the school's Librarian. 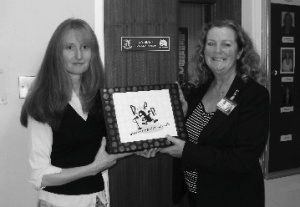 The second drop of 2015 was delivered by poet 'Scrubberjack', to Ernesford Grange Academy in Coventry on 18 March. 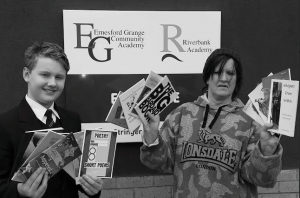 They were accepted by student James Aitken, Library Mentor, on behalf of English teacher, Clare Wheatley, who also looks after the library at the Academy. 13 October saw the first drop of the new academic year was delivered by the lovely Anna Thompson to Tom McMorrow of the English Dept at St John Bosco College in Wandsworth. We love smiley teachers! 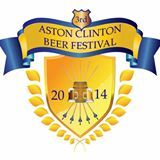 May 20 2014. Our favourite shot so far... and there’s been some great ones over the years! The next Bardaid delivery was presented to The Holy Family Catholic School and Six Form in Walthamstow by, the wickedly talented, Pete the Temp, and the school appears to be very lucky indeed as the delicious Joshua Seigal can also be spotted by the trained poetic eye! 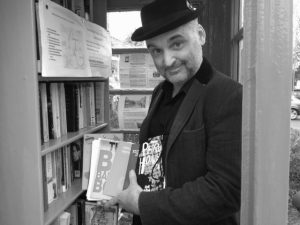 On 30 April 2014, Bardaid’s next cache of Poetry books were delivered by poet and tutor Simon Cleary and songwriter Nathan Loughran (Nat The Hammer) to Oaklands Further Education College in St Albans, Hertfordshire. The books were received by campus Administrator, Mary Muldoon. 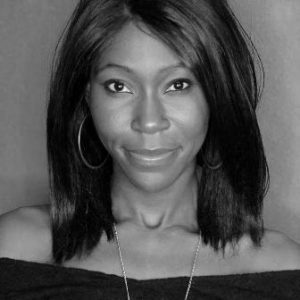 On Friday March 7th 2014, Bardaid's next cache of poetry books were delivered by the wonderful poet, Indigo Williams, to St Gabriels', South London. The books were received by the equally lovely Gail, the school's Librarian. 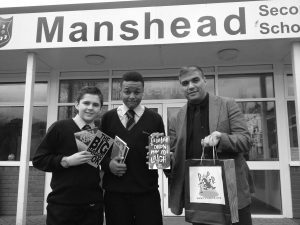 On 12 February 2014, the Bardaid Initiative’s first cache of poetry books of the year were donated to Manshead Secondary School, Dunstable, Bedfordshire and were presented to Mr. Mahmut Dervish, Head of Art. 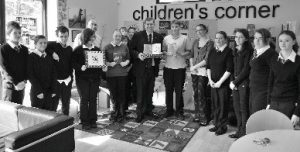 Delivered to St Pauls Catholic School on 7 February 2013 (the day the Pope resigned) by Milton Keynes Poet Laureate, Mr Mark Niel. This cache was accepted by Deputy Head Teacher, Mr Greg Maws. 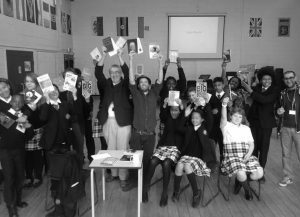 The students pictured participated in a poetry slam with Mr Neil, before receiving their very non-curriculum based books! Danni Antagonist presented the next cache of poetry book to Stony Stratford Library on 22 January 2013, and they were accepted by the Chair of 'Friends of Stony Stratford Library, Mr John Day, on it's behalf. Photograph provided by Jonathan Taylor. Delivered by Milton Keynes Poet Laureate, Mr Mark Niel, this cache was accepted by the School Libraian, Lucy Campion on 3 December 2012. 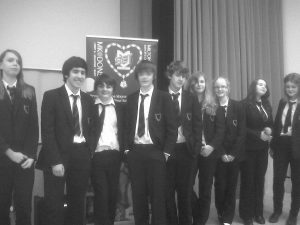 The students are pictured here after a hard day of poetry slamming and receiving some seriously non-curriculum books via the BARDAID Initiative. Delivered by Milton Keynes Poet Laureate, Mr Mark Niel, this cache was accepted by Deputy Head, Mr Ian Bacon, on the 5 November 2012 for their 'Poetic Fireworks Day'. 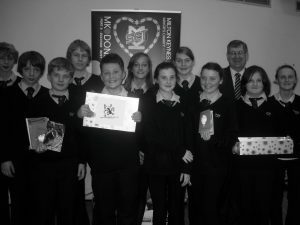 The students pictured reached the final in of the poetry slam at Denbigh School with a selection, this BARDAID donation. 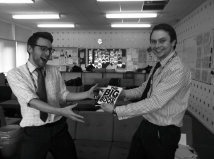 In September 2012, Eston Park Academy received this cache via two of the most fun looking English teachers we at RRRANTS have ever seen, Daniel Robinson and James Goodwill - pictured. 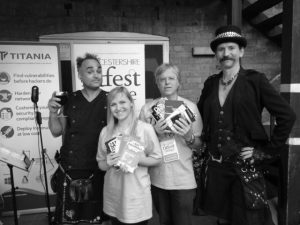 On 22 July 2012, Donna Daniels-Moss presented yet another cache to a local school, where our very own 'PoetHairy' (Stephen Patmore) is the Site Manager. They were accepted by Mr Farrukh Munir, Teacher in Charge - pictured. The recently re-opened school took the opportunity to create a school library, where the books now take pride of place. 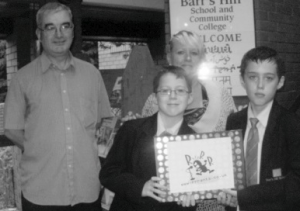 Our very own 'Scrubber Jack' (Jackie Smallridge), delivered another cache of poetry books on 28 June 2012, to Head Librarian, Mr Crilly, pictured here with Jackie and two of her grandsons who attend the school. Having spent the day doing a poetry workshop with Year 9 students, Milton Keynes Poet Laureate, Mr Mark Niel presented this cache to School Librarian, Ms Amber Sexton on 25 March 2012. 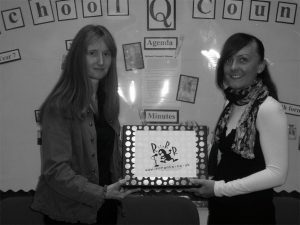 On 1 October 2011, Donna Daniels-Moss presented our fourth cache of poetry books to Yvonne Snow on behalf of the school. The school was delighted and have since put up a poetry and RRANTS, and and we are currently discussing how we can have a mini RRRANTIN' session for the students! 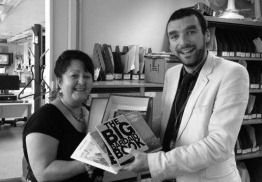 In July 2011, Mr Paul Eccentric himself presented the third ever cache of books to, of all things, the Head of IT, Michelle Gallacher - pictured. 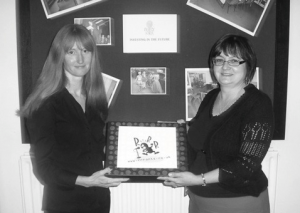 Donna Daniels-Moss presented the second cache on 27 May 2011 to Ms Wendy Castle, Head Librarian - pictured. 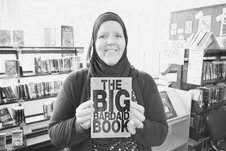 On 26 April 2010, Donna Daniels-Moss presented the a cache of BARDAID books to Ms Siobhan Childers. 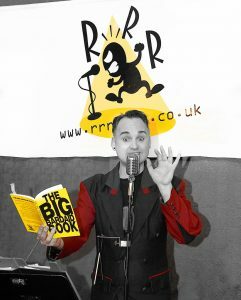 A milestone for the RRRANTS Collective, this was the first school in Hertfordshire to receive the books. Many of which have been donated by established poets in the hope that they will encourage students of 'Generation Wii' to put down their joysticks and pick up the pen, thus creating the poets of tomorrow. Copyright © 2018 RRRANTS. RRRANTS®, BARDAID®, RRRANTANORY®.